Home / It’s our Anniversary! Bedecked and Beadazzled was born September 10, 2010. 16 1/2 years ago! We opened the first brick and mortar store April 1, 2007. Ten years ago! The Beehive of Bedecked and Beadazzled opened November 1, 2015. So many adventures and most importantly so much fun. I love what I do! I have made so many great friends. I’m one lucky girl. This is the best job ever. Let’s celebrate with a month of rewards for you. Golden tickets to stitchy fun! For the entire month of April, 2017 you can take 10% off the entire purchase price of any completed mystery class. That’s canvas, guide and threads! The whole shebang. You know I never do that. I am including past class projects too! 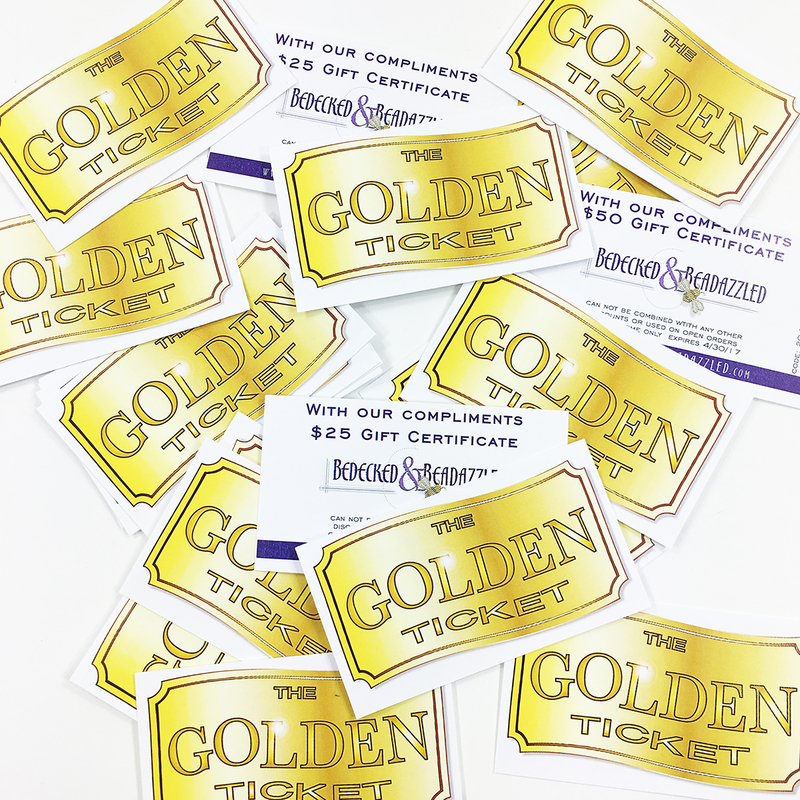 Plus we are sending out golden tickets. If you get something from us, open it now and see if you won a golden ticket. Not all packages wil include tickets. It really is random. Golden tickets are free money for you to spend on new projects. And, we are reinstating the Stash Enhancement Program! What’s this you ask? This is another random moment of fun where we send out coupons via email good toward a future purchase. This will be ongoing, not just for this month! Who knows when you will win one. And if that’s not enough, since its April, it’s time for the Melissa Shirley trunkshow! 20% off all Melissa Shirley canvases! Yay!